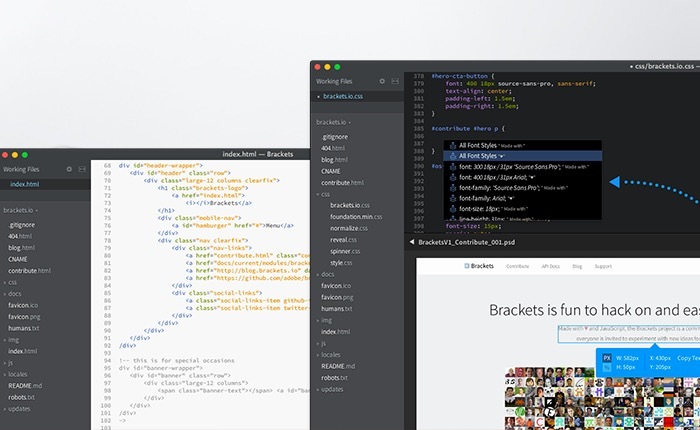 Adobe has today launched a new open source text editor called Adobe Brackets which has been designed to provide users with a lightweight, yet powerful, modern text editor that can be used by web designers and developers. Adobe Brackets includes a number of great features for users including the ability to use the Extract for Brackets, a preview extension lets you pull out design information from a PSD. “Extract for Brackets (Preview) speeds up the process of pulling design information like colors, fonts, and measurement info out of a PSD and turning it into clean, minimal CSS. When we first started Brackets we wanted to release early and often. For more information on the new Adobe Brackets text editor and extension jump over to the Adobe Blog website for details via the link below. Adobe also explains that they will be rolling out the next Brackets update within the next 3-4 weeks.